Devdas or Jism. 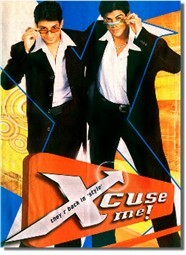 The song is repeated later on, with Udit Narayan replacing Shaan, which makes for a better song. This song might end up a chartbuster, but you´re sure to forget about it in a month´s time. filmi analogies are crazy), or in the composition department. Abhijeet and Sunidhi Chauhan are great for a song that doesn´t demand much. A total time-pass song. Qayamat, lacks any trace of talent in this song. And please, don´t get me started on the lyrics. Nothing could be more lethargic or mundane! Mann and Deewane. But their future as singers is not bright. Through the whole song, they try too hard to sound like K.K., which is an insult to K.K.´s immense talent. The lyrics, once again, are pointless, and are nostaligc of Style (Hum hum hain. Baaki sab paani kum hai). Don´t bother with this one. Finally, there is "Ladki Ladki," sung by the reliable Shaan and Abhijeet, but their abilities are not able to lift this disgraceful song. Downright despicable! That´s it! I´ve had enough! There´s something definitely wrong when there is not a single decent song in an entire soundtrack. I never imagined that so much stupidity in the lyrics department could be found in one soundtrack! Xcuse Me, but Sanjeev-Darshan and Abbas Katka better find their long-lost talent before it´s too late (I think it already is! ).